I first learned of Sam Herron on Face Book. I was impressed with his talent as a photographer. 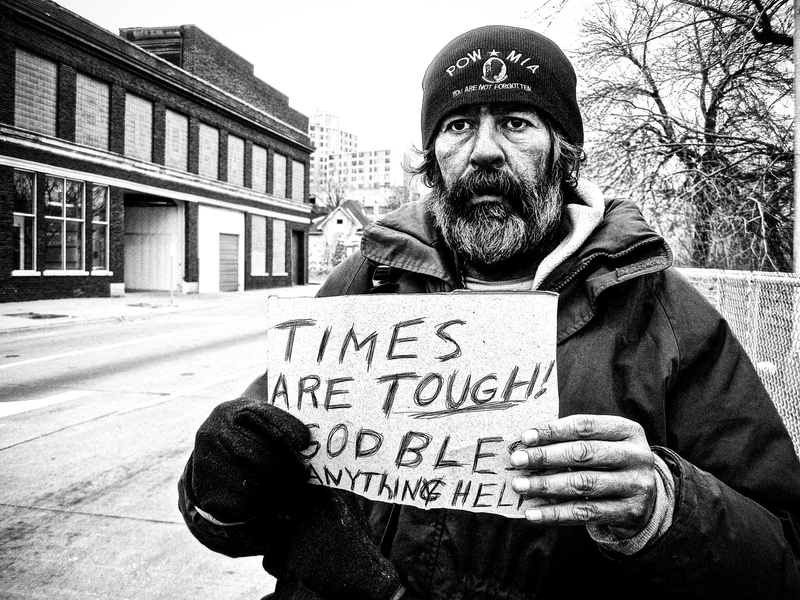 But I was even more impressed with his empathy for those he photographs—the homeless men and women who live on the streets in Omaha, Nebraska. People might wonder how Sam gets these up-close-and-personal glimpses of homeless men and women who spend most of their lives invisible to the general public. Sam doesn’t take pictures just to be taking pictures. He knows many of the people he photographs personally. They talk sometimes for an hour before Sam takes out his camera and asks them if he can photograph them. They tell Sam about their life on the streets, how their day is going, and Sam can relate to all of them. It happened slowly at first. He lost his job. He found another job, but lost that one, too. He was jobless for a month, then two, then four. He struggled with depression and anxiety and he sometimes drank too much. Eventually, after spending his life’s savings and selling most of his possessions, he realized he had nowhere to go. It was the dead of winter, right around Valentine’s Day. The first night, he parked underneath the 10th Street Bridge and shut off his car. He woke up in the morning shivering uncontrollably. His toes were numb. By the end of the first week, Sam had started to develop a routine. He would wake up in the morning, pull on one of his shirts he had carefully folded in the trunk, and drive to the Blue Line Coffee in north downtown just as it opened. Once inside, he would walk to the bathroom, lock the door, and using the sink and the soap dispenser, he would give himself what passed for a bath. He would buy a cup of coffee, open his battered laptop computer and apply for jobs online. And then, if he had any change left, he would buy another cup of coffee and write. He wrote about his life; about his homelessness; or whatever popped into his head. In the afternoon, Sam headed to 13th Street Coffee & Tea in the Old Market and continued to apply for jobs and write on his laptop. At night, he would go to the Rose & Crown Pub near 20th and Howard Streets. The regulars there got to know him and would buy him drinks. Everybody thought he was just an eccentric, tattooed writer who liked to drink. (This was partially true) But what they didn’t know was that Sam stayed there until closing every night because it was warm. It’s hard for Sam to choose his lowest point while he was in this valley, but he says it’s easy to pinpoint the moment when he started climbing back out. It was the moment that he first picked up his old Canon SD 400 camera, (one of the few things he hadn’t sold) and began to shoot photos of his fellow down-and-out fraternity brothers. Sam is doing much better now. He worked as a stand-in for Bruce Dern in Alexander Payne’s movie, “Nebraska.” And he picked up a few photo jobs. Then he picked up a few more. He also started his own freelance photography business. He soon plans to work on a long-term shoot with a fashion photographer. And if things work out, he will travel to exhibit his photos at a Creighton sister university in China. Last year Sam was nominated for Best Emerging Visual Artist by Omaha Entertainment & Arts Awards of 2014. Some of his photos were showcased during the award ceremonies at the RNG gallery in Council Bluffs, Iowa. Sam has done more than just take great photographs. 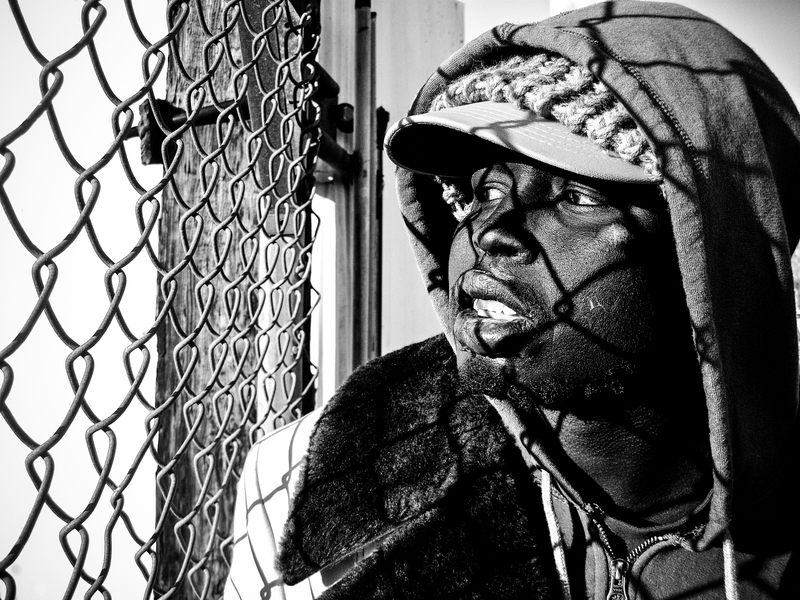 He has given us a glimpse into the invisible world of the homeless community. If you look closely, you will also get a glimpse of the man behind the camera—and hopefully, see a little of yourself there too. More stories like this can be found in The Heartland News Street Newspaper. 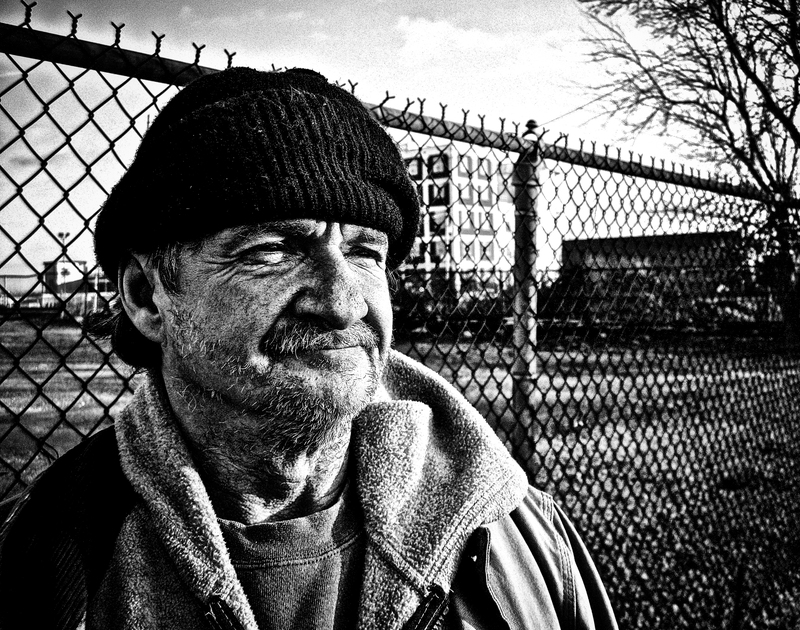 The Heartland News primarily addresses issues related to poverty and homelessness and is distributed by poor or homeless venders. Venders sell the paper for a set price, (usually $1.00) and keep the money they make. For many, this gives them the opportunity for a first small step toward independence and permanent housing. The Heartland News 4001 Ames Ave, Omaha, Ne. 68111. Ahh, Christmas time has come to us again! That time of year when joy fills the hearts of people everywhere. When we find people bustling through department stores and shopping malls to purchase that perfect gift for those they love—that one time of the year when we have peace on earth and good will toward all men. Right? Really? Ask any homeless person if they feel there is good will toward all men. Homeless people are not respected by and large. Many of them will receive a Christmas dinner at a shelter and a few stocking-stuffers, and then it’s back on the street. The number one thing that they need and often deserve, even if you don’t know them, is respect. Respect them as a human being and fellow traveler on this journey we call life. Living on the street is not like camping. You must be consistently on the move, and ready to get up and leave when you are asked to do so. If you are on the street, it is usually because circumstances beyond your control have forced you into that position in life. Living on the street, life is far harder than you could ever possibly imagine if you have never been there. Homeless people have needs like everyone else in this world. Their needs are usually very basic and to give of your time just to talk to them sometimes can really help. But if they don’t want to talk to you, respectfully back away. Otherwise, listen to what they have to say even if it makes absolutely no sense to you. It doesn’t have to. They are talking because they are alone and feel that they are without hope. And being without hope will eventually kill you. There are many things that people on the streets will need to survive. For the homeless to lack some of these items could well lead to their death. To survive, they need things—small things. Like soap, shaving gear, postage stamps, pencils, and paper. Even having a good book will help to alleviate the burdens they carry around mentally every day. The list above is good, but it does not cover the whole issue of how they will get money. Money is the key ingredient that everyone needs, but many will abuse it. If you really want to help a homeless person, give them a job if you can do so. There are many carpenters, electricians, and factory workers that are now homeless. Please do NOT discriminate against them; because everyone else is already doing that. So during this Christmas season of giving, if you have anything that you can give, do so. Some people will argue that this only encourages them to stay on the street. It’s true that it will encourage a few of them to remain where they are, but there are those out there who, by simply giving them a bottle of water, a hot meal, or simply a smile and a kind word, will possibly save their life. • Instead of giving them money directly, go out and purchase Subway gift cards, and the like. Think about this, Subway and many of the sandwich places are selling subs for fewer than five dollars! By giving a homeless person a gift card for 10 or 20 dollars you may well give them food for three to four days! A lot of homeless eat very little and their stomachs are no longer as strong as they used to be. Sandwiches, especially from healthy places like subway, provide a great deal of nutrition that they desperately need. • Do not give a homeless person greasy food! You know what that does to you and what ends up in the toilet? Try eating that and not having the opportunity to use a bathroom! • An inexpensive sturdy back pack can prove to be invaluable to a homeless person. They can use it to safely store all of their items while still being able to remain mobile. • You can usually find inexpensive seasonally appropriate clothing at a local thrift store to give to the homeless—Coats and accessories such as mittens and stocking hats in the winter and shorts and flip flops for the summer. • Blankets are important too. Even when it’s warm during the day, weather can turn cold at night and a person should stay covered when they sleep. • There are many things that can be done, if we simply think of the homeless as our fellow human beings and give them the respect that all humans deserve. Lately there have been so many reports of bad things happening in the world—from terrorist attacks, to riots, to shootings. 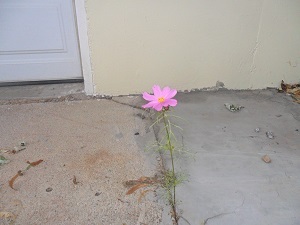 But if we look hard enough finding good that’s being done is like finding a flower blooming in concrete. M,A,Yah saw the homeless in a different light, because at one time he too, was homeless. So he has great compassion for those struggling to survive on the streets. He dreamed one day that he would own a street paper and dedicate it to getting the homeless jobs and hopefully, off the streets. Omaha’s Heartland News street paper has been finding its way into homes and businesses since 2011. But M,A,Yah’s dream literally went up in smoke February 5, 2013, when someone had set fire to his newspaper which was located at 62nd and Ames Avenue at the time. Fortunately no one was hurt. However, M,A,Yah had been residing in the upstairs of the building, and due to the fire he found himself homeless once again. But that did not deter him from going after his dream. Although someone tried to crush it, they didn’t succeed. All he could think about from the time of the fire was getting his paper back up and running again. He said he only lost a building, not his dream. Within 4 months of the fire, M,A,Yah found refuge just 20 blocks east of where his original building was. He moved his newspaper into a building that is shared with a barber at 4001 Ames Avenue and now his paper is back and doing better than ever! The vendors are told to tell people the suggested donation price is $1.00 per paper, but once a person finds out that the venders are homeless, they usually get generous amounts of donations—All of which they get to keep for themselves. This program is designed to help the homeless “Charge Straight out of Poverty,” as the motto goes, by allowing the vendors to keep 75¢ from each paper they collect a dollar donation for. Then they pay The Heartland News .25¢ for each paper they distribute. The money they give to The Heartland News goes back into the fund to get the next issues printed. M,A,Yah also has people that set up tables in front of stores, such as Walmart, No Frills and Bakers who do nothing but collect donations for the paper itself. However, because vendors do not set up at the same locations as the Salvation Army bell ringers, the paper doesn’t do so well in donations this time of year. The Heartland News is not just another venue for panhandlers. Some of the venders are able to find a place to live, while selling the Heartland News. Others meet people that might open up job possibilities for them. The North American Street Paper Association says in just 2 months a vendor could make enough money to put a permanent roof over their head. Table Grace Café is a place that offers food for a free-will offering. They don’t suggest a certain amount of money as a donation. You just give what you feel like giving and nobody knows how much you donated because it all goes into a wooden box at the counter. The pizza-salad-soup combo is standard fare at Table Grace Café. Owner and professional chef Matt Weber is a trained chef who studied at the Natural Gourmet Institute in New York City. Pizza and soup is handmade every day at Table Grace Café and the varieties they offer depend upon what they have available. They have a relationship with Whole Foods, Trader Joe’s and Wohlner’s Grocery and during the growing seasons they get fresh produce donated by local farms. These donations help keep costs low, and helps Matt and his crew continue to offer nutritious food to folks who might otherwise go hungry. It’s important to know that while Table Grace Café certainly helps people who might not otherwise be able to afford this type of meal, this place is for everyone. Everyone is welcome, and everyone is free to pay whatever they want to pay for the food. Whether you drop a couple of quarters into the donation box or a hundred dollar bill, you’re going to receive the same friendly service and wholesome meal as everyone else. The purpose of Table Grace Café is to promote a healthy community by offering great food prepared and served in a graceful manner to anyone who walks through the door. They believe that everyone; regardless of economic status, deserves the chance to eat wonderful food while being treated with respect and dignity. Table Grace Café also has an Internship Program that allows individuals to complete a 2 week training course in restaurant work. After they complete their training they are given job placement assistance by Matt’s staff and volunteers. Table Grace Café also caters dinners for 10-30 people. Just give them a call and they’ll be happy to work out all the details for your event. Whatever your event; Table Grace Café will work with you to accommodate your catering needs. And best of all, by choosing Table Grace Café, you’ll be helping their ministry in downtown Omaha of ‘Nourishing Hungry Bodies and Souls’.